Three years ago, while then-Ohio State student David D’lima was trying to find a subletter for his off-campus apartment, he became frustrated with how difficult it was to find other Ohio State students using sites such as Facebook Marketplace. So D’lima decided to take this problem into his own hands. D’lima, now a software engineer at Capital One, teamed up with longtime friend and then-Miami University (Ohio) student Andrew Hayes and Hayes’ classmate Eric Hill to create the app Kickflip, a streamlined search engine to make it easier for students to find roommates and subletters. The app — which launched a year ago — collects all the best listings for buying and selling content from sites such as Facebook Marketplace and verifies the content so students know if they are buying from someone of the same campus network. 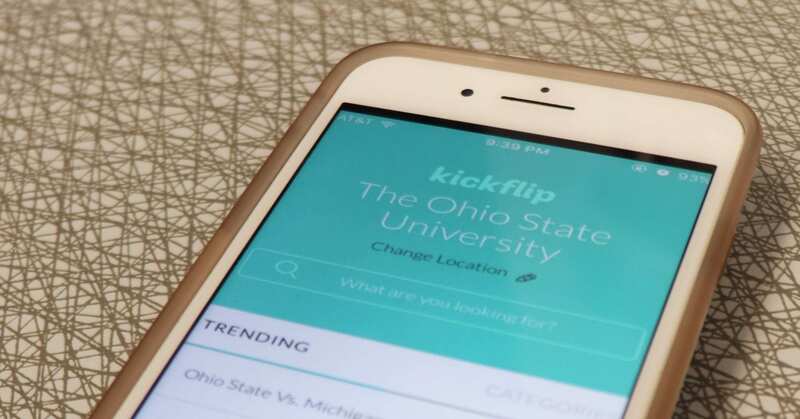 Kickflip is available for 13 universities across the country, including Ohio State, Miami University (Ohio), Pennsylvania State University and Purdue University. The app is not only used for helping students search for roommates and subleases, but also helps students buy and sell textbooks, football tickets, and any other items students might be selling. “We thought, ‘What if instead of trying to get two people on the platform at once, like sellers and buyers, what if we just had a search engine that aggregated what everyone was already selling?’” D’lima said. Hayes, now a software engineer at Accenture, said Kickflip — which has a patent pending — has about 150 users who have downloaded the app and created an account, but Hill said it’s hard to tell how many actually use the app because people who post to Facebook and other sites from which they pull listings are technically users. “We are a grass-roots startup, so we are still trying to get publicity and help students out by showing them that this tool exists,” said Hill, a software engineer at JP Morgan Chase. Hayes said when people who don’t use it are shown the app, it comes off as another Craigslist. But D’lima said those who used it to find a sublease reported that it was really helpful. D’Lima said it can be hard for the app to stand out with thousands of other competitors, but that once users realize Kickflip is more like a search engine, they are amazed by its usefulness. The three did testing for the search engine with Ohio State students before its release, and D’lima said they found that there are students on every campus who can benefit from Kickflip. Hayes said they are not sure how fast they expect the app to grow, but they know students are still going to need an easy way to connect with roommates and subletters. Kickflip is available on the app store on Android and iOS and can be downloaded from getkickflip.com.